Robot soccer tournament displays robots mediocre soccer skills. What’s the Point of a Robot Soccer Tournament if the Robots Are Terrible at Soccer? Robots fight for the ball during their football match in the standard platform league tournament at the RoboCup 2017 in Nagoya, Japan. But maybe nonhumans aren’t so good at soccer. I may be shortsighted—after all, only 63 years passed between the Wright brothers’ first flight and Neil Armstrong’s small step on the moon—but it seems that they have a long way to go to reach that goal. Right now, the kid-size humanoid soccer players look like K’nex robots, walk like penguins, and fall over constantly. The tournament, which has taken place every year since 1997, has nine different competitions, only six of which involve robots physically playing soccer. There are three humanoid divisions, in which kid-size, teen-size, and adult-size bipedal robots “play” soccer against one another. Next, there are “small size” and “medium size” non-humanoid leagues. There is also a “standard platform” league, in which all competitors use the same type of robot, instead of creating their own according to specs. For some reason, this standard player is a communication robot, more C3PO than HK-47, and has very limited movement skills, which allows observers to enjoy “smiling at cute robots taking a tumble when some distance away from the ball,” according to the event organizers. This year, two teams were clear winners. Team NimbRo, from Germany’s University of Bonn, won the humanoid teen-size and adult-size Round Robin competitions by a goal differential of 25 and 26, respectively. Likewise, Team Rhoban, a team based out of the computer science department of Bordeaux University in France, won the kid-size division with a goal differential of 17. To give some idea of how dominant those teams were, the second-place goal differentials for each of those leagues were 3, 0, and 4. As usual with technology, success clusters near the top. Certainly, a lot has improved in robot soccer in recent years. For instance, 2017’s robots are much more likely to make that easy shot than 2012’s robots. When a robot falls over (which, I can’t stress this enough, happens all the time), it no longer sets off a chain of $50,000 dominos. But they lack what makes the game beautiful. When they shoot, their AI adjusts by repeatedly stutter-stepping before pausing and kicking. If you’re betting on a robot soccer team, you’d better hope that your keeper is in the right place at the right time, because they almost never dive toward an incoming ball. The RoboCup also consists of totally inhuman robots playing soccer, and they are actually quite good. The smallest look like little Roombas that clasp the ball in a pair of recessed forceps, and the larger size look like traffic cones on wheels. Both robots zip around the field, coordinating, passing in space, taking one-timers, and actually saving goals by moving toward the shot. Watching them approaches something like fun. 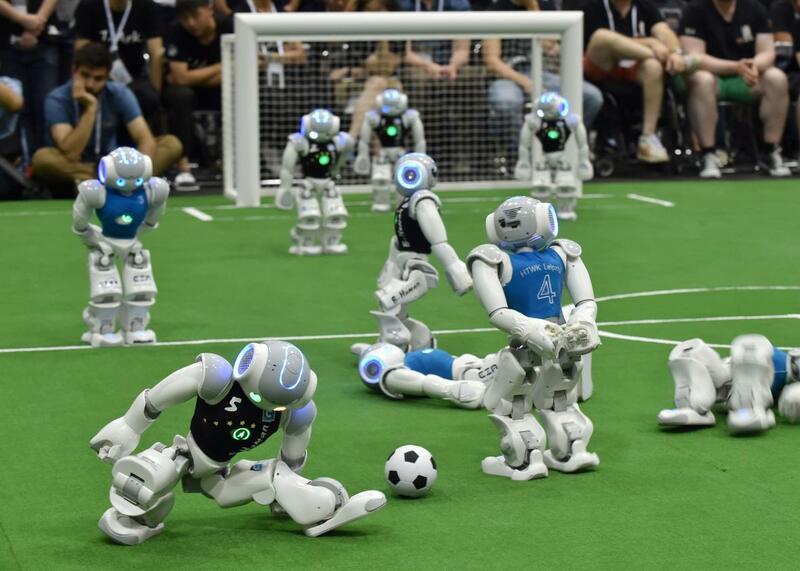 While soccer is the headliner at RoboCup, there are other two competitions that might be more practical, the RoboCup Rescue and the RoboCup Industrial competitions, which focus on goal-oriented tasks that don’t innately lend themselves to human ability. The goal of the first competition is for a robot to follow a fixed path occasionally blocked by obstacles on the route. It’s easy to imagine this robot travelling through a burning building or Fukushima. The goal of the second competitions is for robots to ferry tools from table to table, imitating servers, lab technicians, or advanced factory workers. Those are impressive achievements exactly because they’re difficult and tedious for human to perform. So yes, today’s robots lack Messi’s grace, his lithe touches, mid-turn, slicing between a pack of defenders. But the “point” of the RoboCup isn’t to make soccer robots because soccer robots are cool. The point is that teaching robots to mimic full-body coordination is very hard, and by working on that problem, scientists can make technological breakthroughs relevant in other, more important tasks. A robot may never approach Messi’s jaw-dropping soccer abilities and that’s fine. It doesn’t mean we should stop trying. Because every time one of those robots misses a simple shot, or falls down for no reason, it makes them better at wading through flames to save trapped families—a task the still-human Messi could never accomplish.